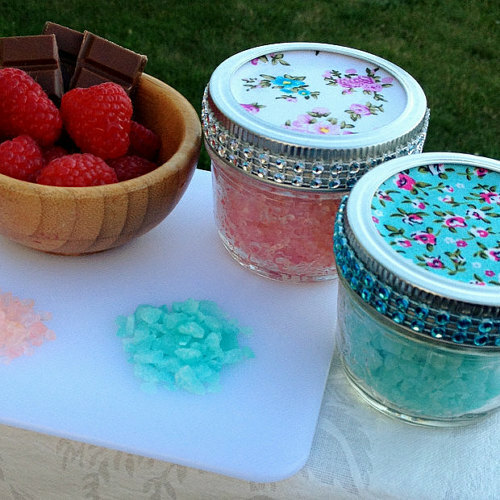 Burning Moon's Inside advice: Sugar And Spice Gifts and Treats Giveaway & Review! Sugar And Spice Gifts and Treats Giveaway & Review! Fun bath products are always a huge hit in our house, not only do I enjoy them but my kids love them as well so I love being able to find stores that sell fun kid friendly bath products. 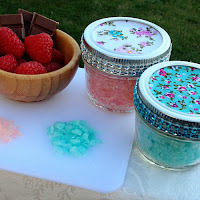 There is a great Etsy shop called Sugar and Spice Gifts and Treats that sells a wide assortment of bath products that are great for kids and adults alike. I recently received a package that contained the following items to test out for a review; Cherry Cheesecake Galaxy Bath Bomb,Cherry Cheesecake Mama Cat & Kittens Bath Bombs,Blue/Green Bubblegum Geode Bath Bomb,Black Light Bath Salts,Princess Cupcake Pony Bath Bomb,Draco Shower Steamer & Pineapple Bath Bomb Singles. I have not tried the Pineapple bath bombs yet, I am unsure if I want to test them out or add them as part of an upcoming beauty giveaway. I didn't even get the chance to fully unpack this box before the kids started asking if they could get in the bath to test out some of the bath bombs. I had to pull out the bath bomb and bath salts I wanted to use and go stash them in the bathroom where the kids can't reach! We tested out these products over the last week, my son tried the Blue/Green Bubblegum Geode Bath Bomb & Draco Shower Steamer, and my daughter tried the Cherry Cheesecake Mama Cat & Kittens Bath Bombs along with the Princess Cupcake Pony Bath Bomb. Blue/Green Bubblegum Geode Bath Bomb; This bath bomb is designed to mimic how a Geode looks and as you can see above it looks pretty close. The lower half is a bath bomb which has a layer of what appears to be an almond oil mixture to hold the bath salts on top on. Pros: It smells good, it looks neat and my son thought it was awesome. Cons: It contained too much coloring, it turned my son and my bathtub blue and the layer holding the bath salts on didn't break up well in the tub it left floating pieces behind. This retails for $5.10 and comes in seven different colors/scents. Cherry Cheesecake Mama Cat & Kittens Bath Bombs; My daughter was so excited to use this because the design is adorable as can be, it comes with one larger Mama cat and two smaller kittens to toss into your bath tub. It smells great and dissolved well in the bathtub. This retails for $3.40 for the Mama cat. Princess Cupcake Pony Bath Bomb; This bath bomb comes with a small pony toy inside, which what kind doesn't like getting new toys and trinkets? My daughter was pretty happy to get a pony out of the bath bomb and she enjoyed how it smelled and how it made her skin feel. Cherry Cheesecake Galaxy Bath Bomb; This is the bath bomb I saved for me! It smells amazing and I enjoy the size of the bath bomb because it made the whole bathroom smell great and it left my skin feeling soft and didn't leave my skin feeling dried out or slimy like some bath bombs can if you add too much oil. One lucky winner is going to receive the prize pack above which contains the following products; peppermint Foot Scrub,Piña Colada Glazed Donut Bath Bomb,Watermelon Lip Scrub,Cotton Candy Lip Balm,Lavender Bath Bomb,Green Apple Bath Bomb,Sweat Pea Shower Steamer,Draco Shower Steamer,Shangri La Sleep Balm & A Cherry Cheesecake Heart Bath Bomb. This is open to US/Canadian residents ONLY!!! Please remember if you DO NOT leave a comment on this blog post as your mandatory entry into the giveaway then all of your entries will be void. Doing the Daily entries will increase your chance of winning. Winners have 72 hours to respond to the notification email! Giveaway entry question: Please visit Sugar & Spice Gifts and Treats and let me know another product you'd love to try out. Cherry Noir Bath Bomb sounds amazing. I would love to try all the products they have. I would like to try the Serene Sleep Lavender Bath Salts. I love your post about bath bomb ,i tried different bath bomb but i have to face a problem bath bombs melt very quickly.I want to buy your products because i have company working with bath bomb packaging box. I hope you will share more tips . I like the Gumball Alley Bath Bomb! I like the My Bloody Valentine Glycerin Soap. I'd like the warm apple pie bath bombs. I like the Autumn oatmeal bath bomb. I like the Cherry Cheesecake Body Scrub. I want to try the Pineapple Bath Bomb Fizzies...they look adorable! Thanks for the super cute giveaway! I love the Sundar Bangle Bath Bomb and the Till Death Do We Part Bath Bombs is so pretty. There's so much to love in her shop, the ding dong the witch is dead is super cute too. I like the Autumn Woodland Soaps, who wouldn't like the cute little animal shapes they come in and the scents sound so fall like it is wonderful. I'd love to try the mini pineapple bath bombs; I really like pineapple. I'd like to get a few of the "My Bloody Valentine Glycerin Soaps". They remind me of SpiderMan so I know my son would love them! I like the Pineapple Bath Bomb Fizzies. The shower steamers look awesome! I think my husband would love those, since he doesn't like to take baths! The Milk and Honey Bar Soap looks good. I would love the Glamour Girl Lip Balm in Cotton Candy Kiss. It sounds awesome!